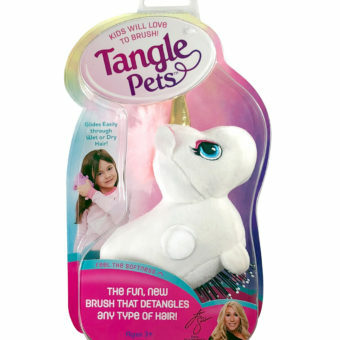 Tangle Pets™ hairbrush allows children to play and brush at the same time. The adorable animal faces and bodies make brush time, fun time! Tangle Pets™ are the perfect size for Mom’s or Children’s hands. High quality, durable bristles easily detangle any type of hair, wet or dry! Super-soft plush characters can be removed and machine washed.